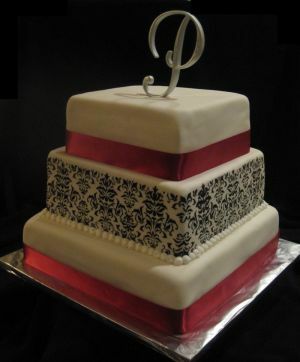 Square wedding cakes are becoming a popular wedding cake design. 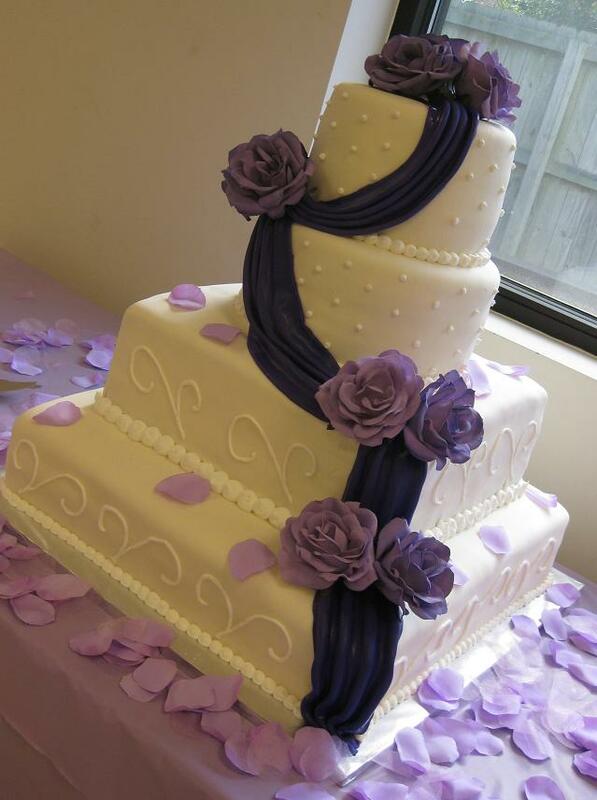 This beautiful lavender theme square and round wedding cake was created for Nicole and her fiancé from Angier, NC. The cake flavor was marble with butter cream filling and covered in hand made marshmallow fondant. 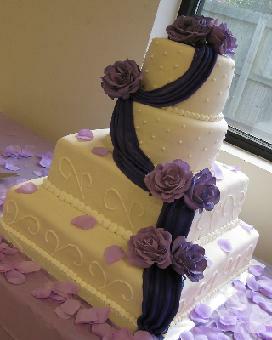 The dark purple swag was made from fondant and the purple roses were silk. 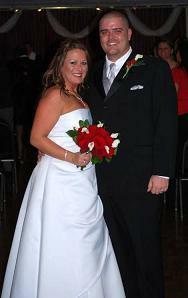 Nicole was a very beautiful bride with a wonderful, charming, and southern personality. The bottom tier was flavored orange dreamsicle cake with whipped cream filling. 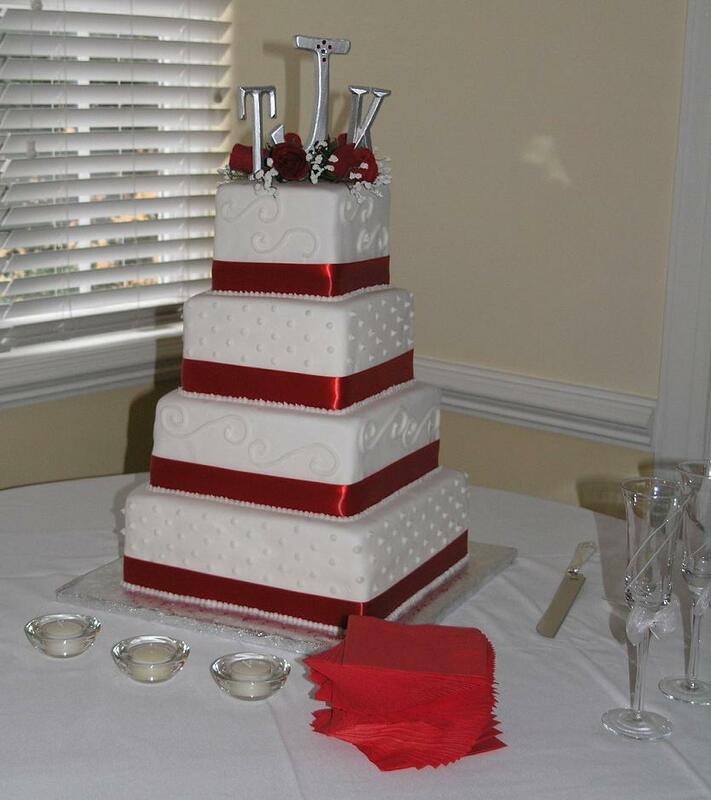 The middle tier was vanilla cake with raspberry filling and to top tier was red velvet with cream cheese filling. All covered with hand made marshmallow fondant. 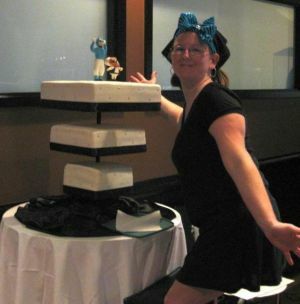 The square cake design was decorated with dragees, fondant ribbon, and topped with a porcelain bride and groom cake topper. The outdoor wedding and reception was held at the beautiful Mineral Springs Inn located in Fuquay Varina, NC. 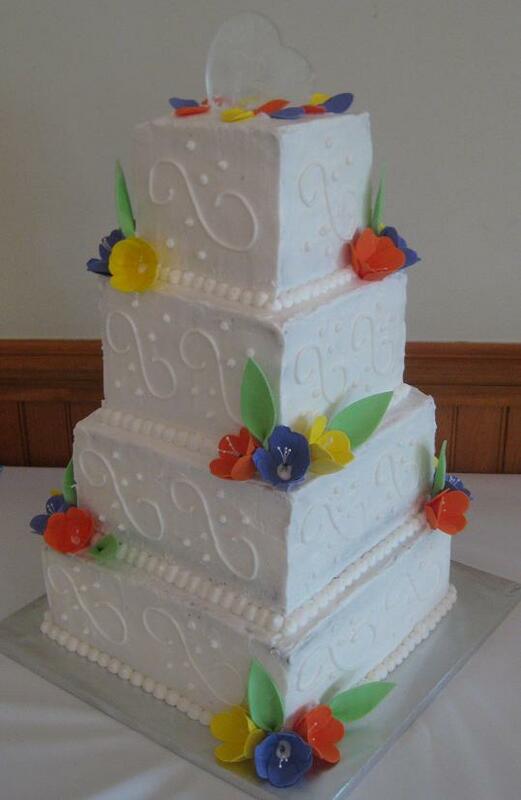 Put your style and personality into the wedding cake by using fondant, fillings, icing, and candy melts to make a unique and special design, just for you. Mix and match flavors and fillings, toppings and frostings to make sure everyone has a piece-a-cake they will enjoy, and remember. 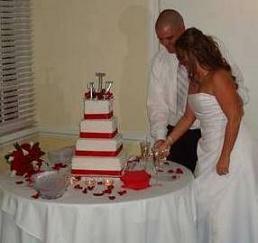 This was a beautiful but simple wedding cake ordered by Michelle from Apex, NC. Her and her fiancé are chocolate lovers so we did chocolate square wedding cake with chocolate butter cream icing covered in marshmallow fondant. 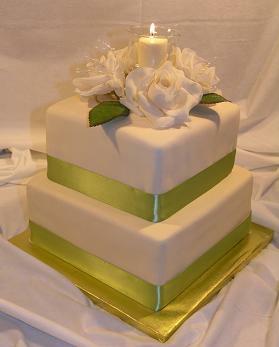 The cake was accented by light green ribbon and topped with roses and a wedding cake candle. ”Girl, let me tell you what; the cake was absolutely beautiful, and tasted amazing. 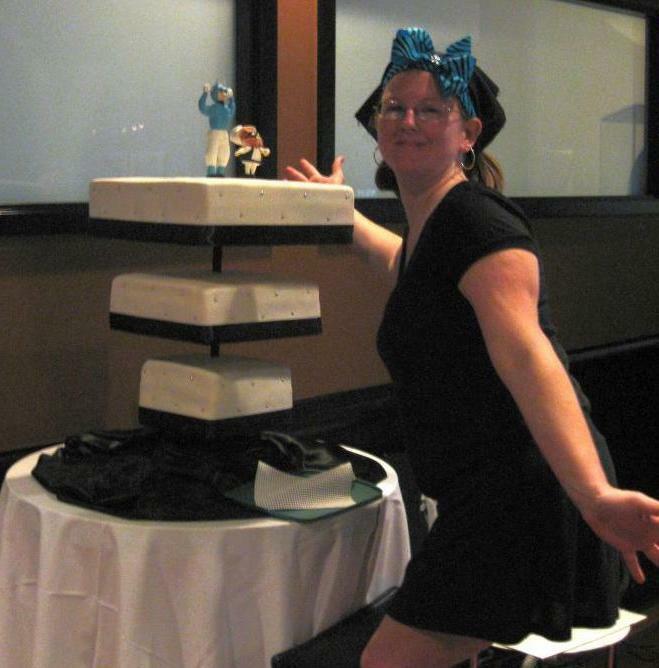 Everyone, and I mean everyone was asking me who made my awesome square wedding cake? The French vanilla was the first to go. We had the chocolate and marble leftover to take home. I took the marble to work to take to my boss since he left before the cake was cut, and some marble to also share with coworkers. And, kept some chocolate at home for Keith and me. I've had some of both, and as I told you earlier, I do not have much of a sweet tooth, but both cakes were very good. Mom took some cake too. She is going to serve some at Christmas. I'm so glad I found you online. And, will recommend you to everyone I know. Thanks again. Your husband was absolutely right when he told you to start your own business doing what you are so very good at! It was a joy to make a new friend. Best wishes Tiffany! 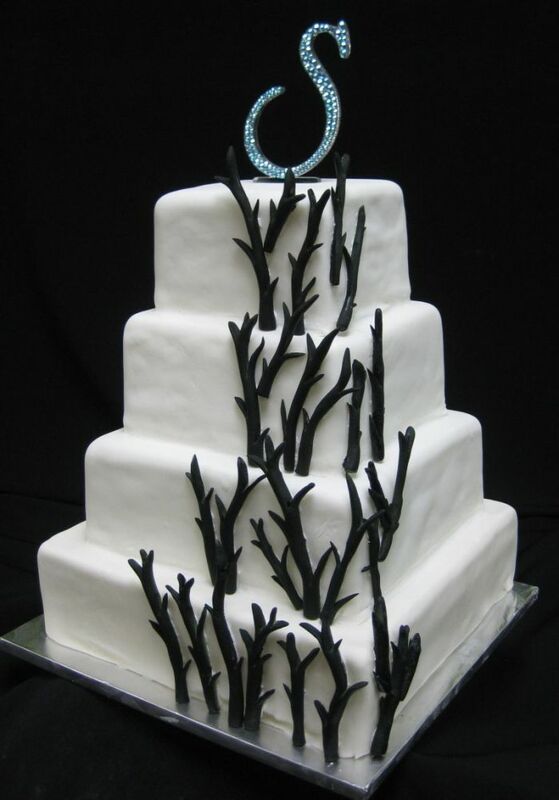 Design your special cake to express your personality, like this upside down wedding cake. 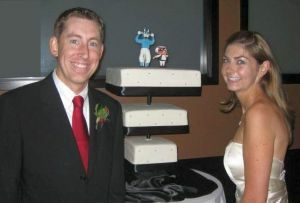 Adorned with their college mascots for wedding cake toppers, this square wedding cake was the talk of the reception...and very fun to make! The wedding cake flavors were vanilla with butter cream icing and strawberry filling, yummy! ”Steph! You out did yourself! Not only was the cake awesome to look at, I mean who can top an upside down square wedding cake with Mascots on it, and it tasted Fabulous! We had more comments on that cake than anything! It was the hit of the party. I can't thank you enough for all of your hard work that I know you put into that cake. 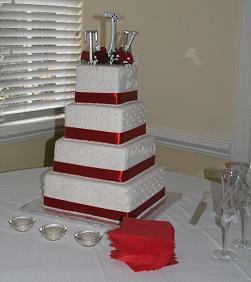 The square wedding cake flavors were bottom tier white cake, then yellow cake, red velvet, and topped off with marble. They all had butter cream filling and covered with hand made marshmallow fondant. The cake was topped with a unique bride and groom wedding cake topper. The venue was the Raleigh Country Club, a very elegant setting. 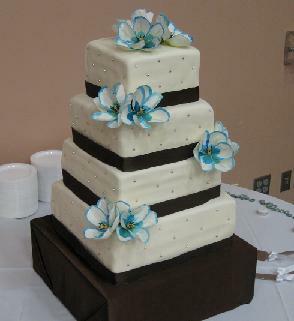 This wedding cake with flowers was covered with hand made buttercream icing. The colorful flowers were hand made with marshmallow fondant with a little gum paste mixed it. The buttercream cake flavors were yellow and chocolate with buttercream filling. 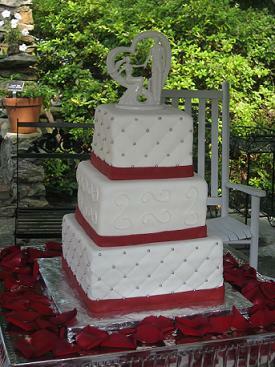 Casondra L. of Hamlet, NC, ordered this square wedding cake with ribbon. I met with Casondra and her wedding planner Shanique for a cake tasting and consultation. Casondra had a picture of a cake that she wanted but wanted to alter it a little, so we came up with ideas and ended up with this beautiful one of a kind wedding cake! The cake flavors were almond with cream cheese, marble with butter cream, and coconut with butter cream all covered in marshmallow fondant and decorated with silver dragees (non-edible). We put ribbon around the bottom of each cake tier and placed a few silk flowers that I hand painted a touch of tiffany blue coloring to the petals. 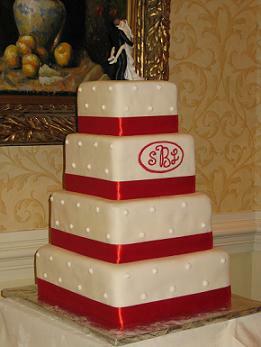 This damask square wedding cake with red ribbon is a great example of pattern design matching. This was Casondra’s fiancé’s surprise groom’s cake. His favorite things are brownies, walnuts, and UNC. 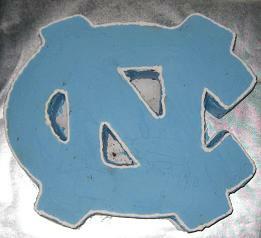 So we make him a brownie cake with walnuts filled, covered with whipped cream icing, and carved in the shape of the UNC school logo. Of course I tasted the cuttings and OMG it was delicious! See Our Groom Cakes Here! 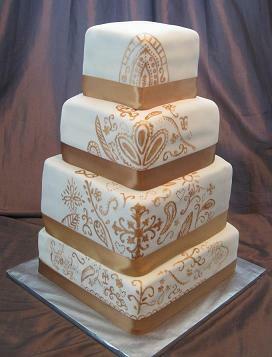 Reena B. and her fiancé Chad of New York ordered this square henna wedding cake. The couple got married here in Pinehurst, NC and Reena’s heritage is from India. She wanted this beautiful hand painted henna cake for their wedding. The flavors were carrot cake with cream cheese icing, vanilla cake with strawberry filling, chocolate with chocolate butter cream, and butter pecan with butter cream and strawberry filling. The cake was covered in marshmallow fondant. The bottom of each tier was wrapped with real satin ribbon and the henna hand painting was done with edible gold luster dust. 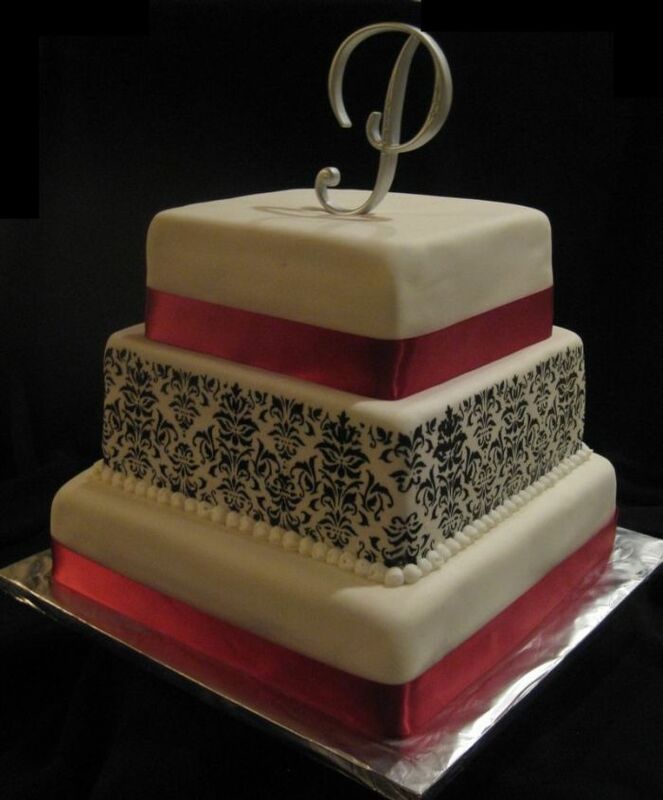 This modern square wedding cake had four different cake flavors. 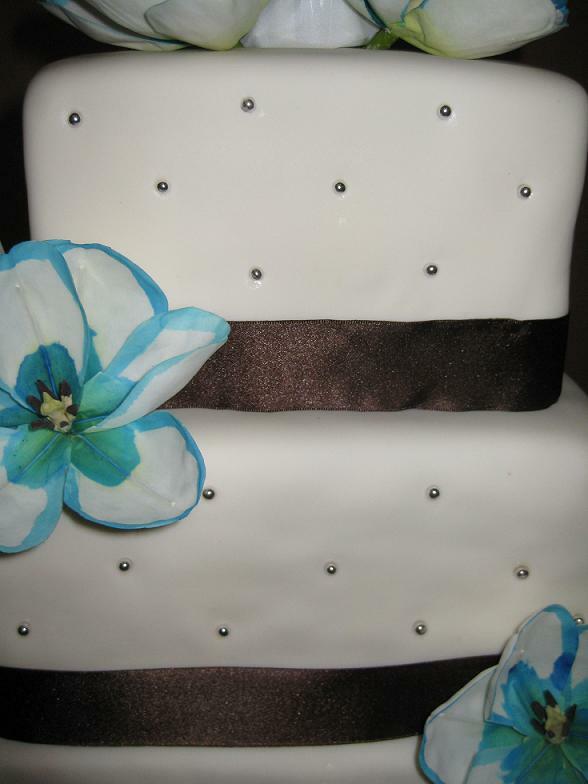 A simple design can make a spectacular cake! E-mail Steph about your square wedding cakes design ideas.